We think it is perfect for the lunchbox or a picnic with a flask of green tea! Your child will also thoroughly enjoy molding the onigiri! With a handheld blender, mash the chicken stew a little to have smaller chunks of ingredients. Heat up the SG Chicken & Mushroom Ragout soup till bubbling and mix in cooked rice once heated. Add salt to taste and toasted white sesame seeds. Spread out the mixture and fan a little till it is cool enough to handle. Using the onigiri mold or cling wrap, mold the rice into a triangle. Add the seaweed strips as a finishing touch. 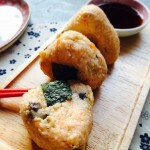 Place onigiri on a plate with a saucer of light soy sauce for dipping if desired. Enjoy ~ Itadakimasu!